Two images came to mind when I first heard about a local “chocolate society”: 1. A secret, subterranean meeting involving initiation rites, or 2. a wacky Willy Wonka-style utopia. It’s something between the two. Just past 7 p.m., 30 people of all ages sit at Caputo’s Market & Deli as society chair Brian Ruggles (pictured), wearing a Slash wig for Halloween, starts the evening. “Tonight is special: We have a guru of the Utah chocolate scene,” he says. Eric Durtschi, owner of Crio Br%uFFFD—a company that makes a coffee-like beverage made from cacao beans—is discussing “the future of chocolate,” which is essentially a commitment to artisanal practices and continued farmer education to achieve superior results. This is an atypical society meeting, though. “We normally circle up and try chocolate; it’s pretty informal,” Ruggles says. With discernible palates, members will sample the top echelon of fine chocolates without seeing the wrapper. This is to help refine their skills. Some members can precisely nail the bean’s origin. 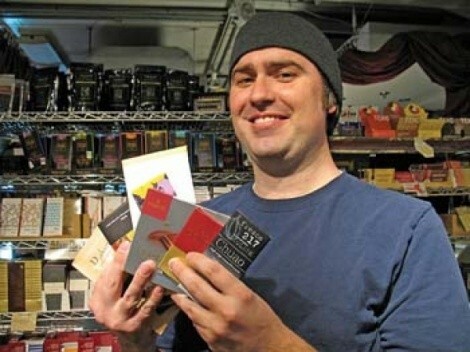 “I’m a chocolate nerd, and I wanted an outlet for other nerds to get together,” Ruggles says, adding he went to his first Intro to Chocolate class at Caputo’s in December 2008. He soon began teaching intro classes at work and to friends, which naturally led to this advanced outlet for enthusiasts. The prerequisite to join is to take the introductory chocolate class at the downtown Caputo’s location (314 W. 300 South), usually the first Monday of the month at 7:15 p.m., and to, generally, care about the art. “We’re not trying to stay underground, but we’re also not aggressively recruiting new people,” Ruggles says. The society’s annual dues are $15, and each monthly tasting is $5 to cover chocolate costs. After the talk, samples of Amano Guayas and Amedei Chuao, among others, are tasted. “This is the good stuff—the reason why we’re in the chocolate society,” Ruggles says.